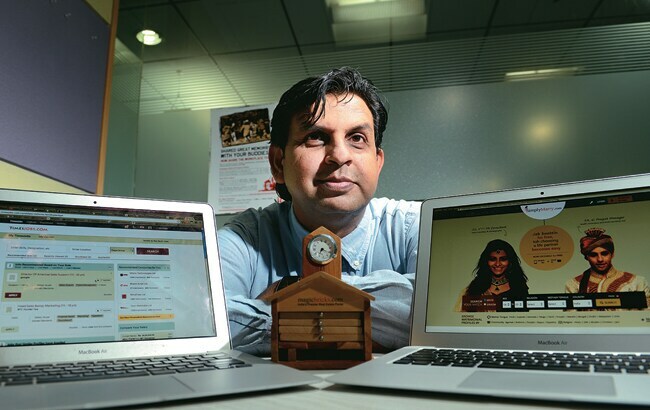 With Naukri.com, Info Edge made a dream debut on the stock market. 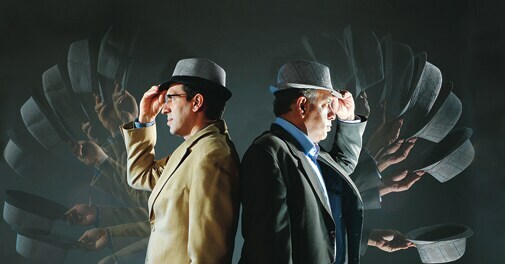 But with the downturn, founder Sanjeev Bikhchandani and CEO Hitesh Oberoi are betting on other ventures. In 2006, when Info Edge India was planning an initial public offering (IPO), its founder Sanjeev Bikhchandani was told by many that the price he was seeking for the shares was way too high. Bikhchandani had fixed this at Rs 320 per share, which translated into a trailing price-earning (P/E) multiple of 52.6. A far better established Infosys, in comparison, commanded a P/E of 41.71 at the time. Bikhchandani, however, went ahead. The market response showed that if anything, Bikhchandani had undervalued his own company. Within about 20 minutes of its listing, Info Edge's stock price touched Rs 623.8 apiece before climbing further to Rs 1,688 apiece in just over an year, reaching a P/E of 102.2. "I was told that I was being aggressive. It was very hard to predict where the stock would go because we were new to stock markets. But maybe we under-priced it," he says. But today, eight years later, with Info Edge's price trading at Rs 547.85 on April 11 (the company has awarded share bonuses twice), things are very different. The company's growth has hit a brick wall, largely due to the economic slowdown, which in turn has badly affected its flagship online recruitment business, Naukri.com. Hiring is down, and so is Naukri. According to a Manpower India employment outlook survey, the hiring forecast was weakest in India among Asia-Pacific region in the past eight years in 2013. Naukri growth has been stunted over the past seven quarters - up from Rs 83 crore in first quarter of 2012/13 to Rs 91 crore in third quarter of 2013/14. Revenues for the first three quarters of 2013/14 are a mere 9.27 per cent higher than that of the corresponding period of 2012/13. (See Changing Mix). "The (Naukri) business is not growing as of now. When GDP growth comes down, so does employment growth. As the economy bounces back, so will Naukri," says Bikhchandani. Analysts broadly agree. "The naukri (jobs) business is a function of several variables which have not been great for the past few years," says Abhishek Shindadkar, analyst at ICICI Securities. Naukri's fate has had Info Edge looking for newer avenues of growth. In fact, the company has 14 businesses in all, of which eight are internal and rest, investments in other companies. Among its own businesses are the online real-estate site, 99acres.com, the online matrimonial site, Jeevansathi.com, and the education site, Shiksha.com. Its investments are in digital companies - Zomato, Meritnation, Mydala, PolicyBazaar and Canvera. Info Edge's second biggest business, with over Rs 85 crore in revenues, is 99acres. This company ties up with brokers and developers to list their properties on its site. It already has the largest number of listings among online sites, about 600,000 - its closest competitor MagicBricks has 500,000. Around 15,000 brokers and 3,000 developers are associated with 99acres. The offline real estate advertising market at present is roughly Rs 3,000 crore, according to Info Edge sources, while online is around Rs 250 crore, or less than 10 per cent. "But with user awareness increasing, the market is moving from offline to online. The task is to take this 10 per cent to 30-40 per cent in the next few years," says Hitesh Oberoi, CEO and Managing Director, Info Edge. Oberoi took over from Bikhchandani about four years ago so the latter could concentrate on external investments. 99acres has adopted a five-fold strategy: increase the number of property listings on its site along with quality data, invest heavily in products and technology, increase branding and promotion, focus on mobile, and above all, expand the sales teams' outreach. Here, Bikhchandani is trying to replicate Naukri's success model. In its initial years, Naukri was highly sales-driven, with a large sales staff in around 20 major cities which aggressively wooed recruitment consultants and headhunters, explaining to them the benefits of online - as against conventional offline - recruitment: lower costs, wider reach. They often helped consultants set up their IT infrastructure. 99acres is going the same way, with a staff strength of 800 of which more than 500 are in sales. "In the past two years, we have doubled our 99acres staff," says Oberoi. But competition is intensifying in the real estate business, especially with the entry of two new players with innovative products: Commonfloor and Housing.com. Housing, for instance, is offering a property verification service which has become an instant hit with end users. But its size gives 99acres an advantage. "One of the secrets of Naukri's success was that it always has the most number of jobs. And if you have that, you will get the most traffic," says Bikhchandani. The focus on mobile can be seen in the mobile app 99acres launched last month, three years after introducing a mobile-only website. Its current traffic share from mobile is 24 per cent. "There's fair bit of evangelisation that needs to be done with brokers," says Bikhchandani. "As we go down the broker value chain, we find that there are some who are not computer-savvy. But with smartphones proliferating and our app being put up, we are in an advantageous position." Unlike Naukri and 99acres, which are in the forefront of their respective segments, matrimony site Jeevansathi.com is at No. 3, behind BharatMatrimony and Shaadi.com. As at other such sites, registration is free, but to contact others who are also registered, paid membership is required. The company is trying hard to increase the conversion rate - from free to paid, and currently at 10 per cent - to turn profitable. Since this is a person-to-person affair with minimal interference from the sales team, the conversion rate is low. "We are planning to take the conversion rate to 12-14 per cent through predictive analysis," says Bikhchandani. "Once we do that, we will start making money." Shiksha.com, which provides online education information, makes money through listings and generating leads for educational institutions. "The idea behind Shiksha is the same as 99acres," says Oberoi. "Education is the second largest advertising category in print after real estate, some Rs 2,000 crore. Info Edge wants to capture this market." 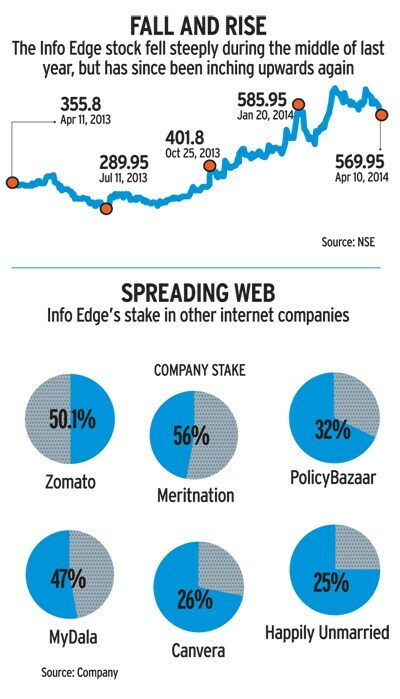 Among the companies Info Edge has invested in (see Spreading Web), online restaurant guide Zomato.com remains the most promising bet. Info Edge has put in Rs 143 crore in five rounds, the most recent tranche in last November when Zomato was valued at Rs 1,000 crore. Bikhchandani says the thought of investing in other companies came to him around 2008 as the core business was generating plenty of cash. "We were already in four verticals - jobs, matrimony, education and realty. We didn't want to run a fifth internally because we wanted to get at least one of the businesses right (apart from Naukri). At the same time, there are opportunities out there," Oberoi adds. 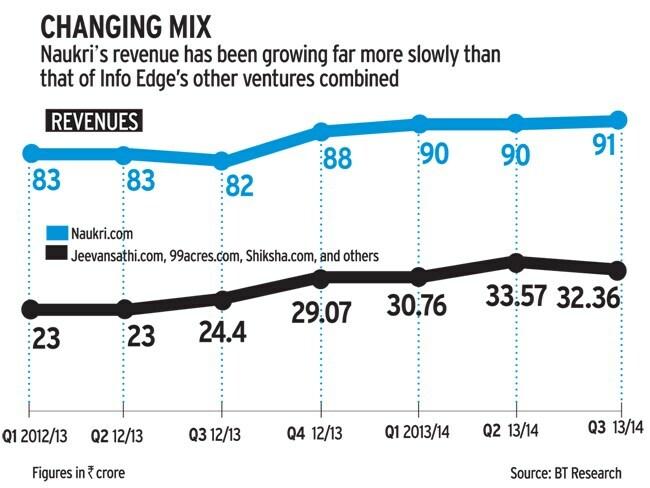 Still, among all the businesses of Info Edge, including the investee companies, only Naukri is profitable so far. It is generating all the cash that is funding the other businesses. Analysts, however, agree that the focus on the non-employment companies is the right track. According to an Ambit Capital report, Overblown Hopes, published this January, "the standalone non-recruitment business (of Info Edge) has increased by more than 30 per cent year-on-year in each of the last six quarters, particularly led by 99acres. We expect continued growth momentum... Info Edge will need to increase its investment in the businesses to maintain its market share." While Oberoi holds the fort, Bikchandani today is entirely focused on external investments, meeting two or three company heads almost every day. He has met close to 400 of them to make his nine investments so far. Three of them, worth Rs 35.6 crore, did not turn out well and Info Edge has written them off . "Six out of nine is a pretty good hit rate in the venture capital business. All six are not successes yet, but it looks like they are moving in the right direction," says Bikchandani. What sort of future does he see? Bikhchandani says five years from now he wants to see four or five of his businesses - either owned fully or substantially - to have a billion-dollar market capital each if they were to list on the stock exchange. It seems like a tall order because Info Edge itself is currently valued at just over $1 billion. Rivals certainly have a very different view. "Growth rate in the property business has slowed of late. Transactions have fallen due to market conditions," says Vivek Madhukar, COO, Times Business Solutions, a direct competitor to Info Edge in the recruitment (TimesJobs), real estate (MagicBricks) and matrimony (SimplyMarry) segments. In the matrimonial category, which is already stitched up between BharatMatrimony and Shaadi, Madhukar adds: "It will be very difficult for a third player to break into that league without a highly differentiated product." Saurabh Mukherjea, CEO, Institutional Equities at Ambit Capital says Info Edge has done a good job of investing its money - around Rs 450 crore - judiciously. But he has some reservations too. "Zomato is a market leader but tomorrow, if a global giant like TripAdvisor focuses on the Indian restaurant business, Zomato will struggle. Besides, apart from 99acres and Zomato, success stories will be difficult to find," he says.